Home > Europe > What to eat in Sardinia? 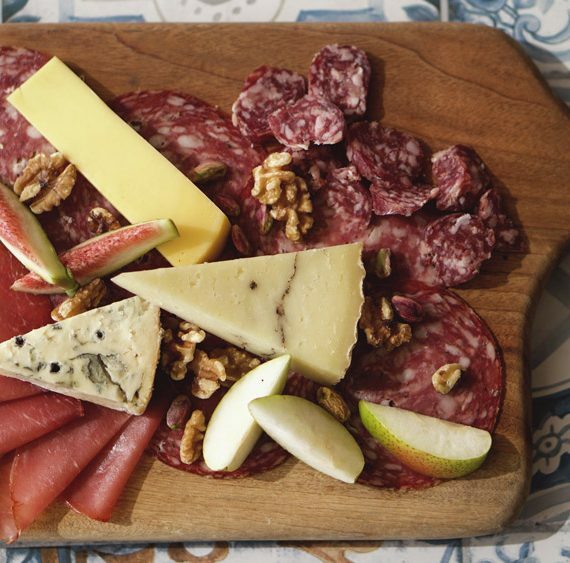 As well as standard Italian cured pork charcuterie like pancetta, prosciutto and lonza, salsiccia sarda (Sardinian sausage) is a cross between salami and sausage. It’s usually a combination of lean and fat pork seasoned with fennel, anise and pepper and stuffed into intestines that have been dipped in wine or vinegar. The ends are tied together to form a horseshoe. The tastiest salsiccia sarda are rustic versions made from wild boar and smoked over myrtle. There’s also a lamb sausage, mixed with a little beef, and a very smelly goat sausage that is not for the faint-hearted. 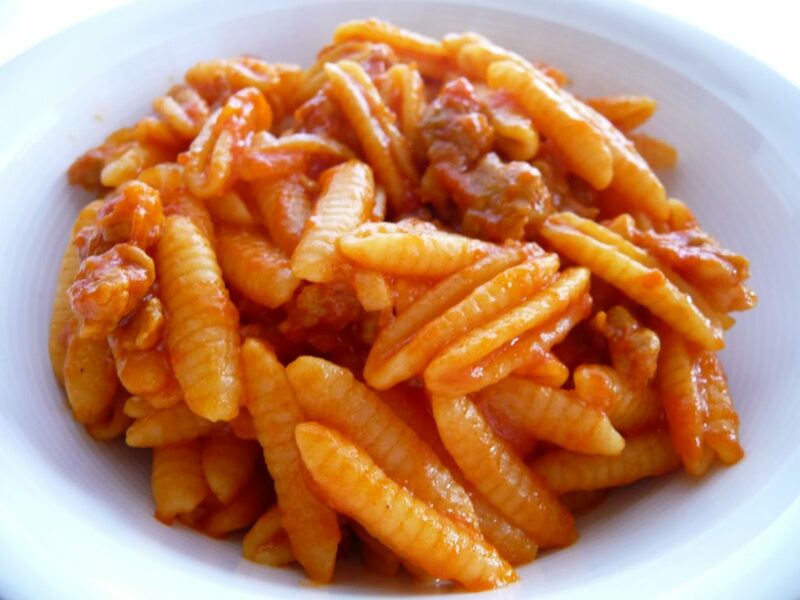 Malloreddus is a kind of smaller Gnocchi, made of semolina flour, appreciated all over the island. Though it may have a different name according to the area it is made. It may be prepared in several different ways, often it has a yellowish colour due to the ingredient that characterized also its unique taste: Saffron. 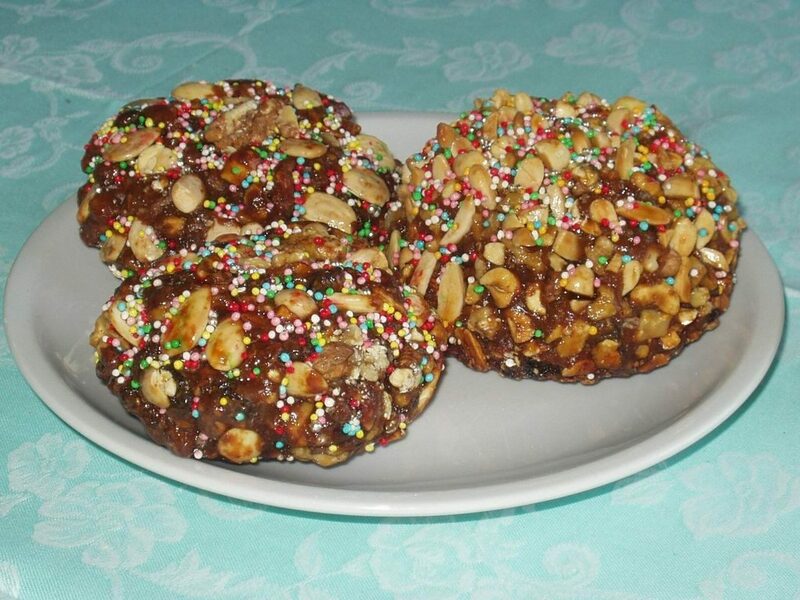 Seada is a Sardinian dessert. 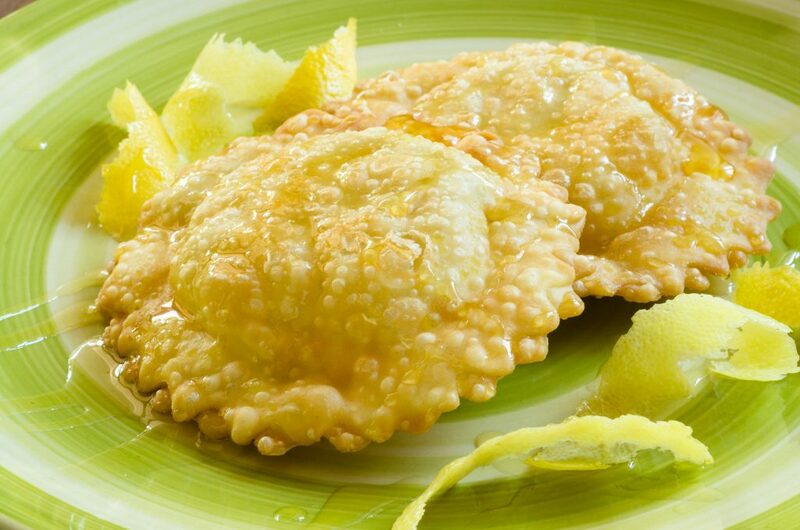 It is prepared by deep-frying semolina dumplings with a filling of Pecorino cheese in olive oil or lard, and is served covered with honey or sugar. 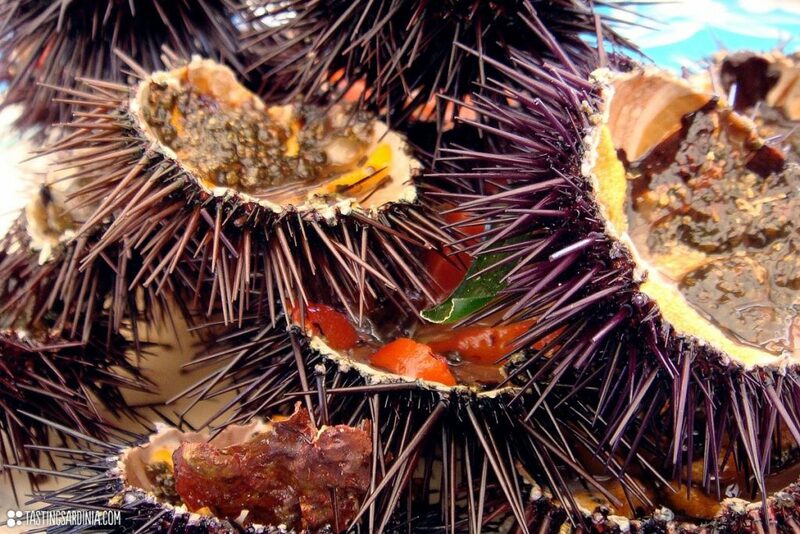 Sea urchins are one of Sardinia’s delicacies, so much so, each year the island hosts a number of festivals celebrating this tasty shellfish. 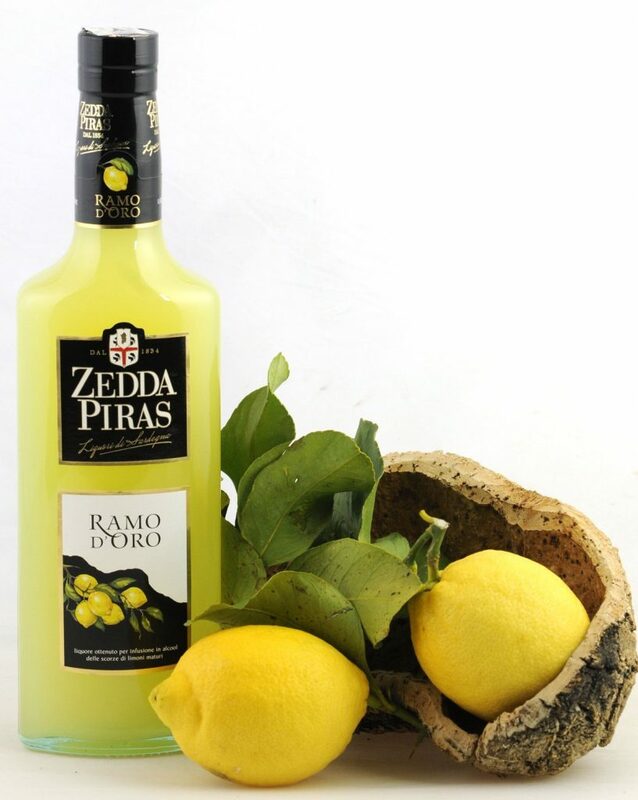 Limoncello is an Italian lemon liqueur, and while predominantly produced in Southern Italy, it is also made in Sardinia. It is the second most popular liqueur in Italy, and has recently become popular in other parts of the world. Pane e Saba or Bread and Saba is a traditional dessert of Sardinia. Cooked mostly during the ‘All Saints Day’ (La Festa di Ognissanti) and ‘All Souls day’ (ll Giorno dei Morti) on the first week of November. The dish is sweet and aromatic which serves as a delicacy during festivities like Christmas and Easter. The end of the harvest season in the island marks the production of Saba (cooked wine), the condiment used here and in many recipes around Italy. Pecorino sardo, also known as fiore sardo, is a firm cheese from the Italian island of Sardinia which is made from sheep milk: specifically from the milk of the local Sardinian breed. It was awarded Denominazione d’Originestatus in 1991 and granted Protected designation of origin (PDO) protection in 1996, the year in which this European Union certification scheme was introduced. Its flavour is different from that of the Pecorino Romano, which is also made on the island. Sardo is richer while romano is much more biting and salty. 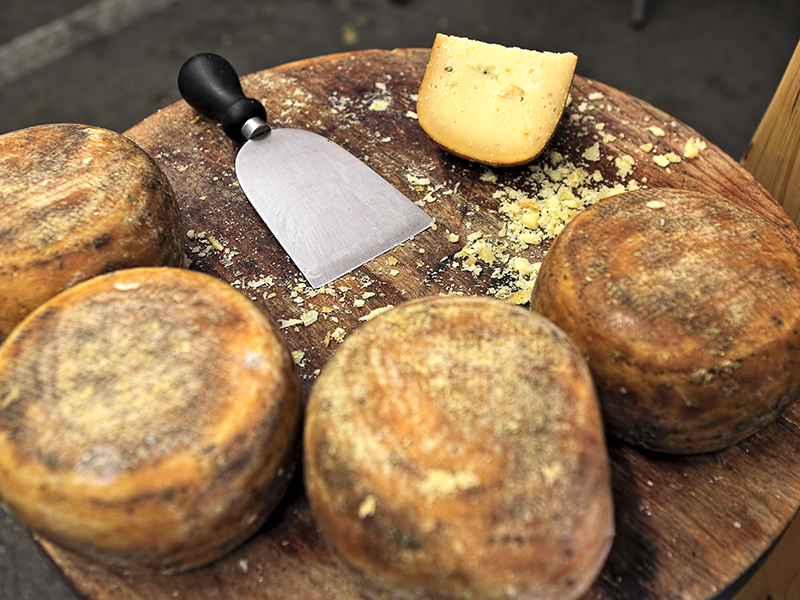 Pecorino sardo is an uncooked hard cheese made from fresh whole sheep’s milk curdled using lamb or kid rennet. 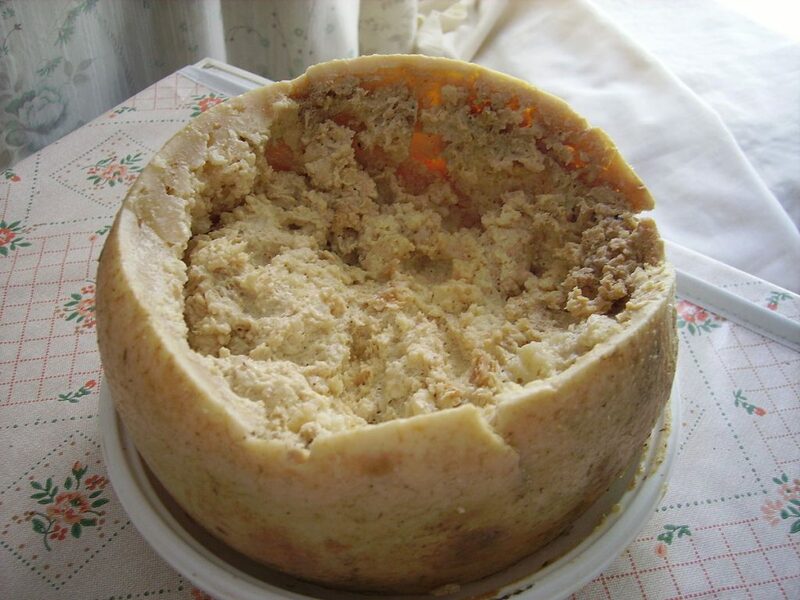 Casu marzu , also called casu modde, casu cundídu and casu fràzigu in Sardinian language, or in Italian formaggio marcio), literally translating into English as “rotten/putrid cheese”, is a traditional Sardinian sheep milk cheese, that contains live insect larvae (maggots). Although found in the island of Sardinia, a variety of this cheese is also found on the nearby island of Corsica, where it goes by the name of casgiu merzu. 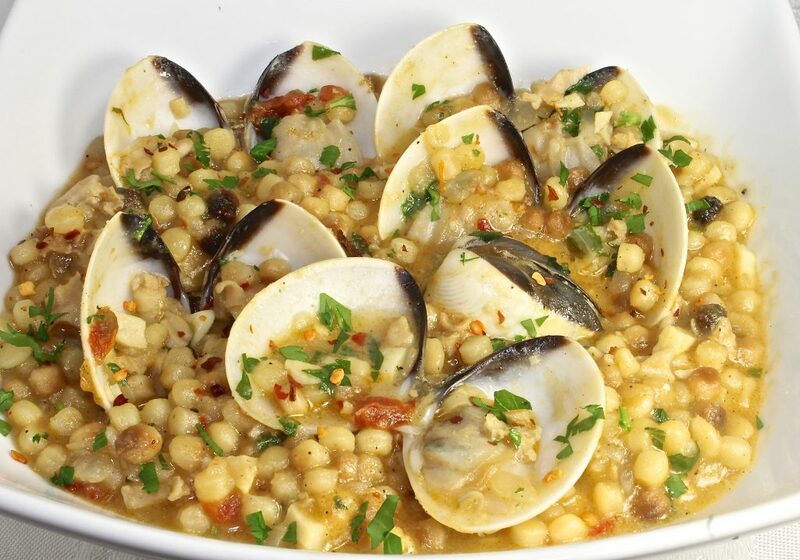 Fregula (also fregola) is a type of pasta from Sardegna. It is similar to North African Berkoukes and Israeli ptitim. Fregula comes in varying sizes, but typically consists of semolina dough that has been rolled into balls 2–3 mm in diameter and toasted in an oven. 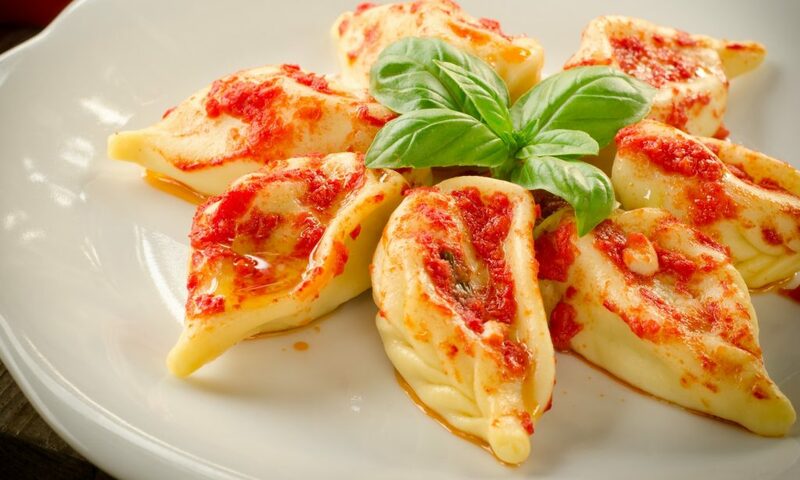 Culurgiones is a traditional dish of Ogliastra, a region situated in Sardinia. 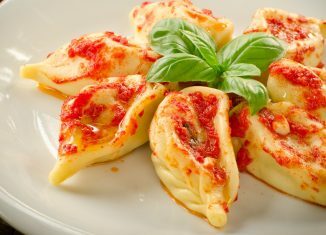 These are Sardinian stuffed pockets with 2-4 inches in length and 1-2 inches of width. The dough is made from semolina flour, white floor, eggs, water and salt giving a soft crust to the ravioli. 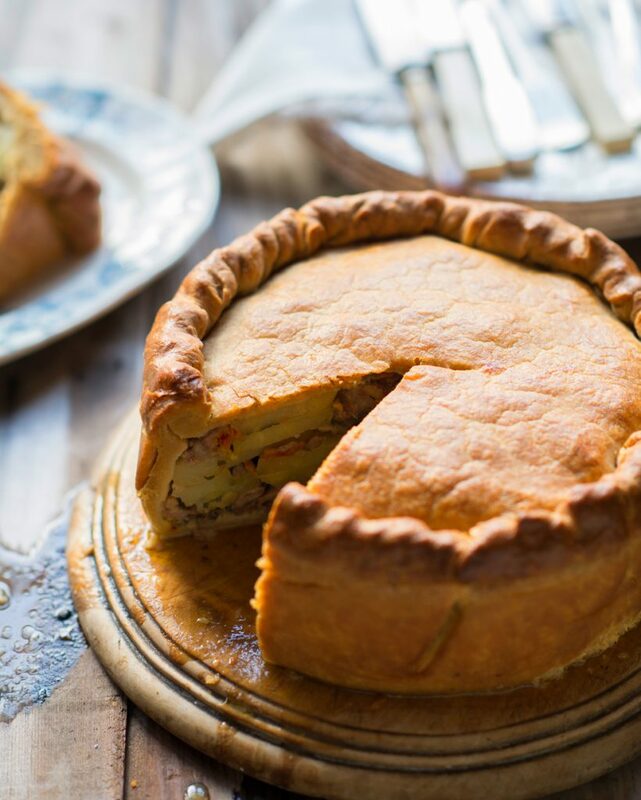 The filling is commonly made with boiled potatoes, olive oil, pecorino cheese, garlic, mint and nutmeg. Pane carasau is a traditional flatbread from Sardinia. It is thin and crisp, usually in the form of a dish half a meter wide. 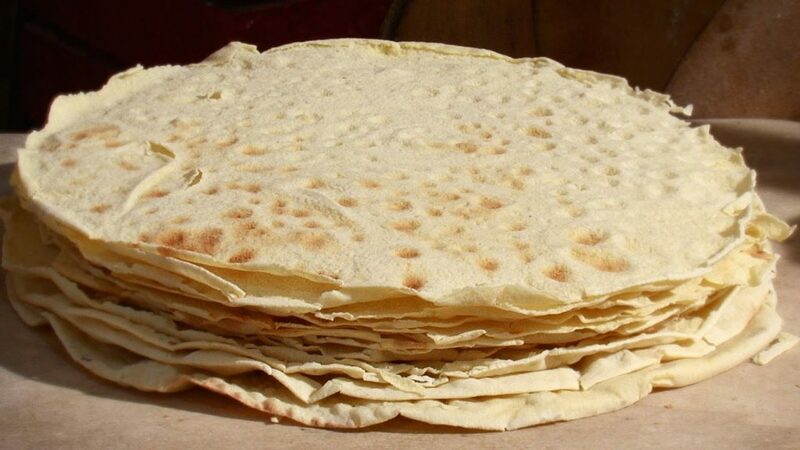 It is made by taking baked flat bread (made of durum wheat flour, salt, yeast and water), then separating it into two sheets which are baked again. 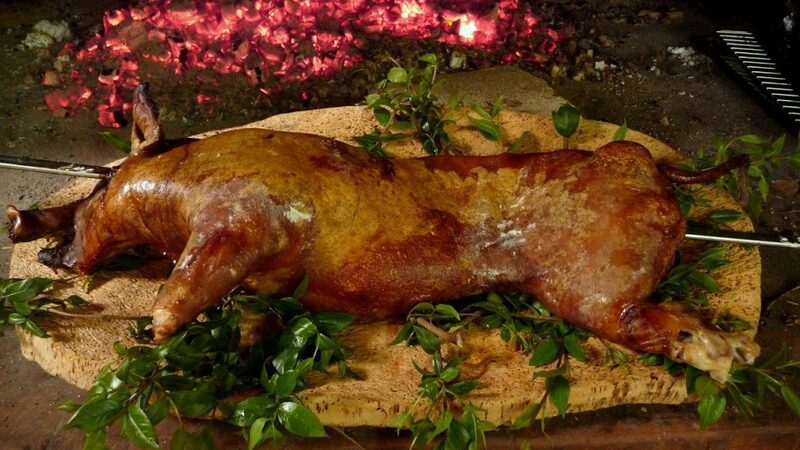 The recipe is very ancient and was conceived for shepherds, who used to stay far from home for months at a time. Pane carasau can last up to one year if it is kept dry. The bread can be eaten either dry or wet (with water, wine, or sauces). 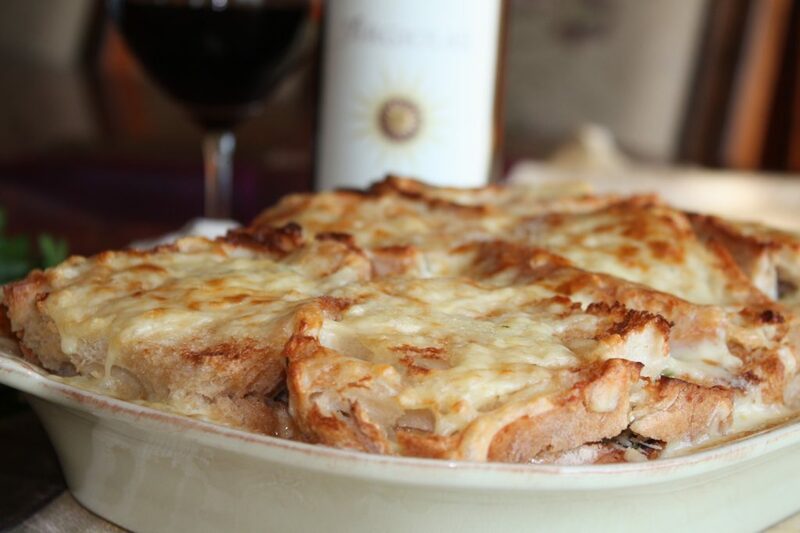 Zuppa Gallurese isn’t actually a soup (although it does use broth) but a cross between a lasagna and a casserole. It is a combination of bread, cheese and more cheese snugly resting in a bath of warm, rich broth. 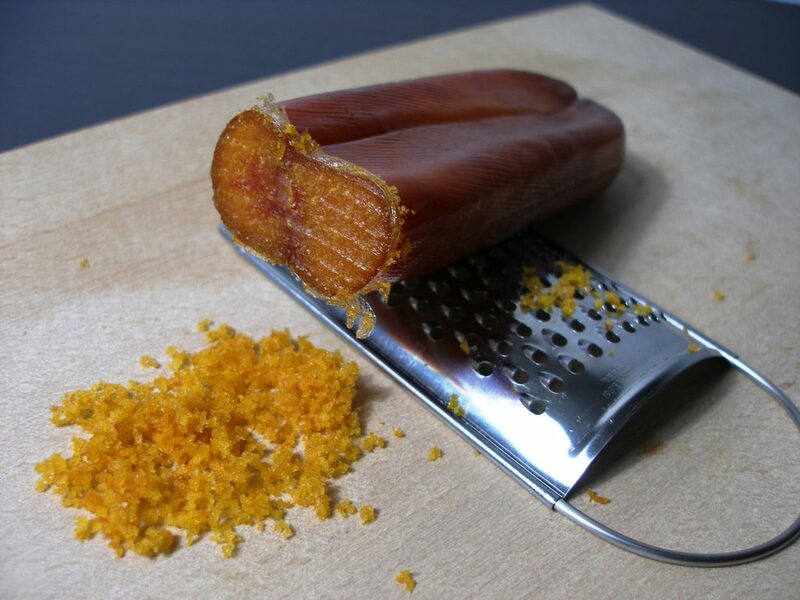 Bottarga is the Italian name for a delicacy of salted, cured fish roe, typically of the grey mullet or the bluefin tuna (bottarga di tonno), frequently found near coastlines throughout the world, that often is featured in Mediterranean cuisine and consumed in many other regions of the world. The food bears many different names and is prepared in several different ways. 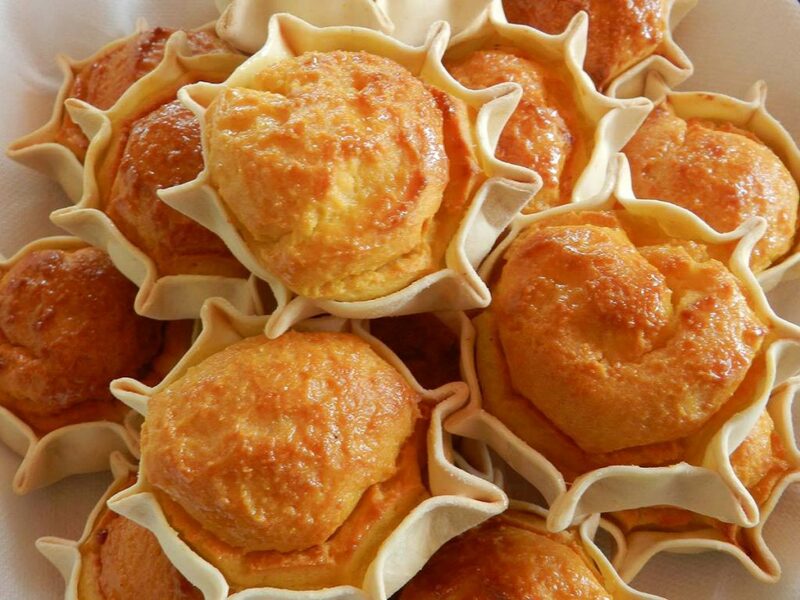 During the Easter in Sardinia, the most typical Sardinian sweets are the so-called pardulas: delicious and delicate little pies, stuffed with a filling of ricotta cheese or cheese, depending on your tastes. 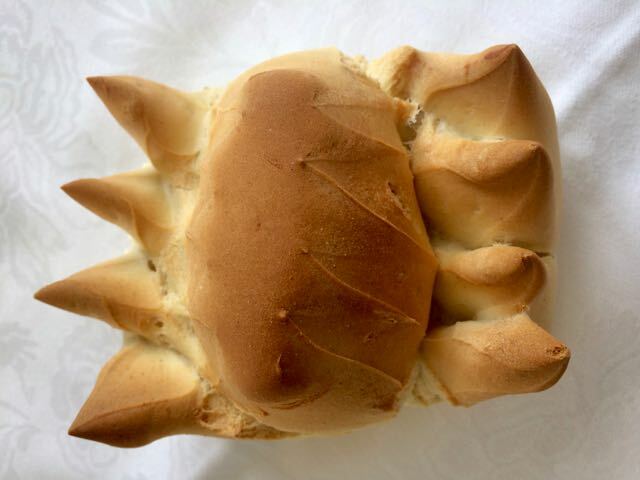 Pabassinas are the typical Sardinian pastries for All Saints’ Day as well as for Christmas. 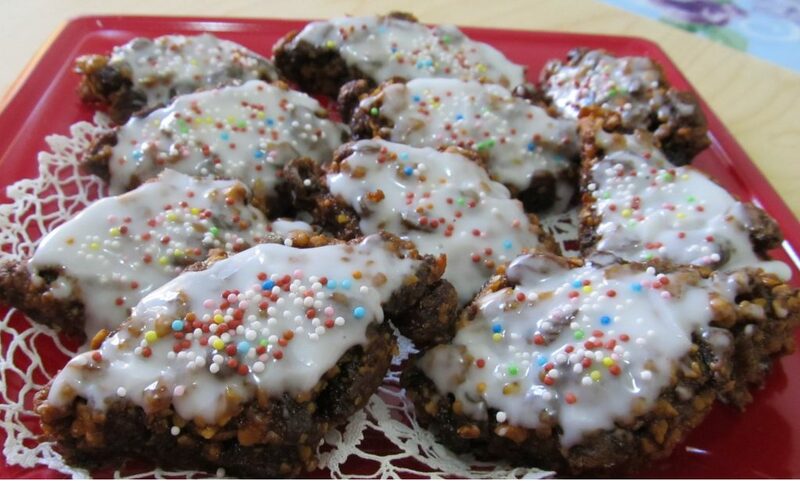 They are also called papassini, papassinos o pabassinus after the name of the Sardinian word for raisins. It’s mainly made of walnuts, almonds, and raisins.